Parents, listen up: put your kids in engineering and computer science classes. A recent Bureau of Labor Statistics report says “software development skills continue to be the most in-demand” STEM (science, technology, engineering, and math) related jobs in the United States, and the White House projects that there will be over one million unfilled jobs in STEM related fields by 2020. And perhaps one of the easiest ways to encourage this interest is with toys. Toys and kits that are designed to teach kids hacking and basic programming skills abound, and they cater to a range of ages and skill levels. “It’s important that we create learning experiences for kids that help to see what’s possible for them, what they can do, who they can be, and the changes that they can make to what’s around them,” said Eric Rosenbaum, who is an electronics kit designer and has a PhD from MIT’s Lifelong Kindergarten group. Experts suggest options with a good balance between open play and structure. “Given the right kinds of tools and toys that embed within them the appropriate scaffolding for a child, a good kit will help the child to inquire about their playspace and learn a tremendous amount on their own,” says Noah Finkelstein professor of Physics and Education at the University of Colorado in Boulder. First contact with the kit, like through packaging and instructions, is extremely important. Not all kids are inclined to read manuals, so a good kit should be intuitive enough to piece together somewhat out of the box. Another thing that’s crucial: immediate feedback. You should be able to try something and get a visible result from it quickly, says kit designer Rosenbaum. But pictures on the box matter too. Is the kit inclusive to all types of children? A good learning kit should speak to the diversity of a child’s interests. 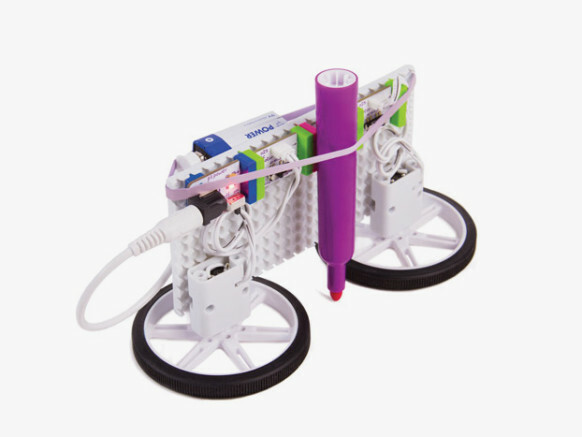 Here are some of our favorite kits to get your kids started. Happy hacking!